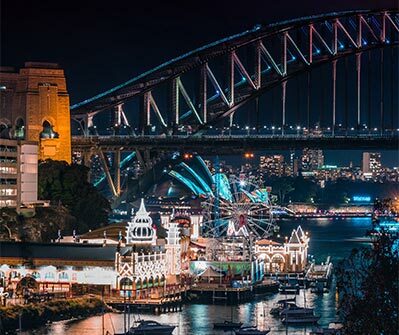 When Governor Arthur Phillip first arrived in Sydney Harbour in 1788, he described it as ‘the finest harbour in the world’. Almost 230 years later, few would disagree. 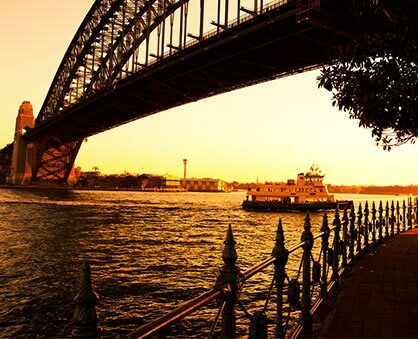 Many would even argue that manmade structures like the iconic Harbour Bridge and the Sydney Opera House have only added to the harbour’s natural beauty, its fame and its mystique. Blue is the colour you’ll see in every direction from this address. It’s also the name of this amazingly positioned and appointed residential development. 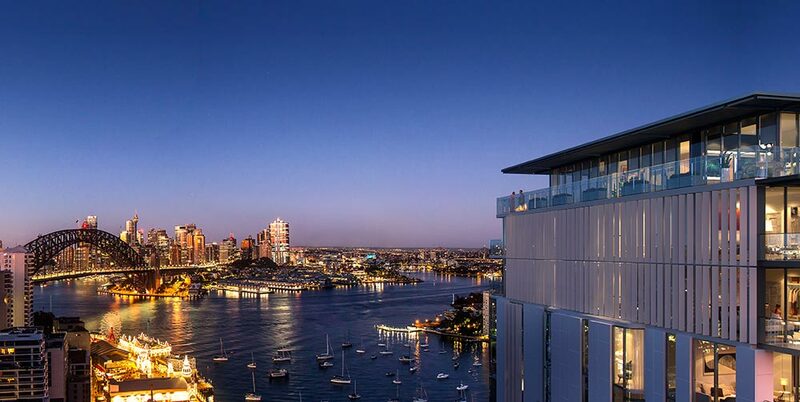 Blue by Aqualand is harbour-side living at its very finest. 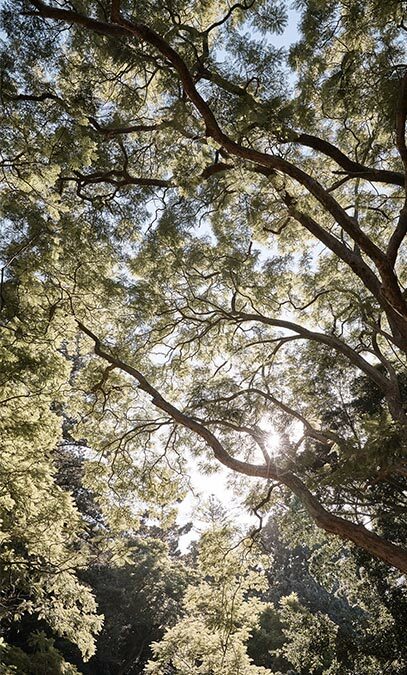 Far enough from the city to view it in all its glory yet close enough to be amongst it in minutes, to enjoy world-class entertainment, dining and sporting events. Arrive in style The shared spaces in Blue have been treated with the same care and consideration as the interiors of the apartments. 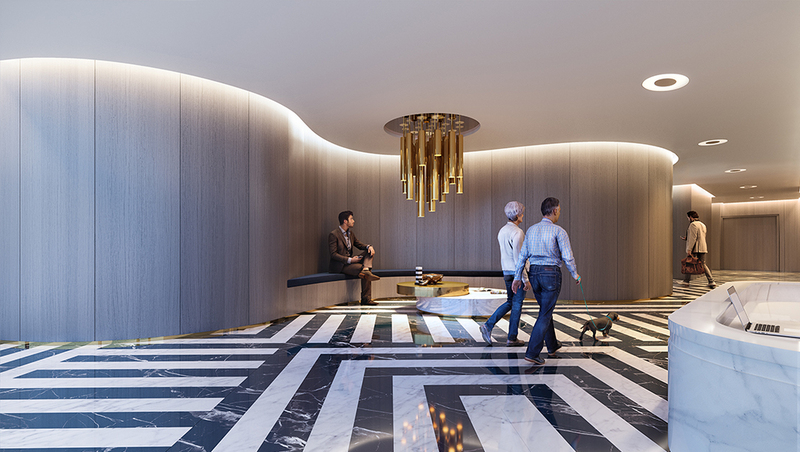 From the expansive glass ceilinged entrance, allowing light to filter through to reflect on the exquisitely designed marble floor, to the brass trim and comfortable seating, the entrance to Blue sets the tone for the finishes in the private living spaces. Not content to be merely a gateway to the elevator, the lobby was designed to make a statement. The floor consists of a bespoke pattern of deep dark blue and fine white marble, where footsteps echo softly off the fabric covered walls, the texture of which is reminiscent of the sandstone found in the base of the building. 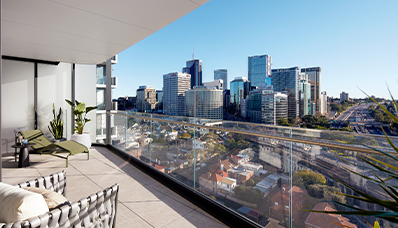 Deco Refresh Deco Refresh was designed to celebrate the natural beauty of Lavender Bay; drawing deep into each apartment a selection of colourful hues mimicking the delicate light play of the harbour. At the centre of this scheme is a sense of calm and tranquillity with a colour palette of deep teal and misty sprays of aqua. 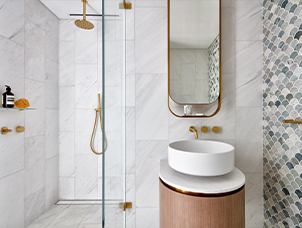 An intricate play of subtle textures and materials in cool tones add to the feeling of light and openness while touches of brass and timber joinery overlay a sense of classic charm. 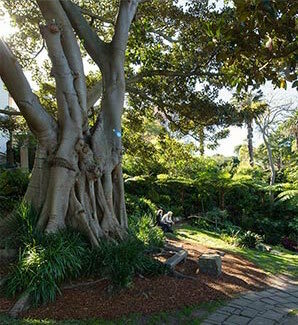 Sublime Canvas Lavender Bay has long been known as somewhat of an artists enclave with a number of notable Australian artists attracted to the area’s eclectic mix of Victorian Italianate mansions, secluded parks and sweeping harbour views. Sublime Canvas was inspired by the idea of an artist’s canvas, a more subdued base onto which owners can layer their own personal touches. The scheme has been designed around a sense of purity and lightness. A base of a warm timber and stone is layered with a sequence of muted tones and textures. Splashes of blood red, amethyst and pewter round out the aesthetic giving it a unique sense of charisma. The kitchens feature an expanse of natural stone which is sure to captivate and inspire. 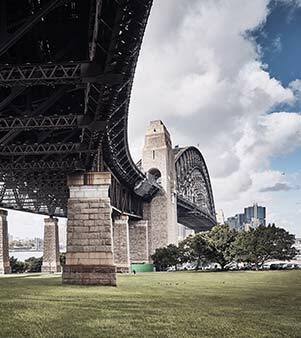 Bay bespoke Inspired by the imposing silhouette of the Sydney Harbour Bridge and the rich, tactile heritage of Lavender Bay this scheme is suited to those looking for something bold and dramatic with a fashion forward feel. Essentially working with a monochromatic palette the scheme layers a selection of rich, dark timbers and dramatic signature stone to great effect. Delicate overlays of tiny mosaics, white marble and brass fittings add to the luxurious tone while subtle textured seagrass wallpaper adds warmth to the master bedroom. 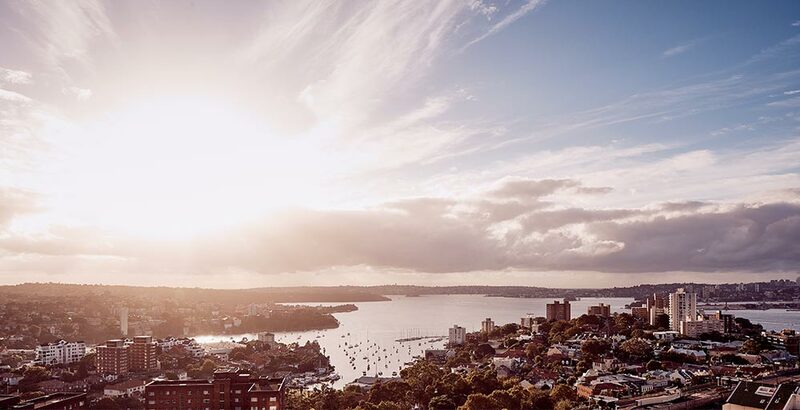 A sublime combination of charm and convenience, Domain recently crowned Lavender Bay Sydney’s most liveable suburb. ‘Stunning harbour views’, its unique village atmosphere and rich, living heritage were just a few of the reasons why, as were its proximity to schools, shops, cafes and restaurants as well as its connection to train, bus and ferry services. 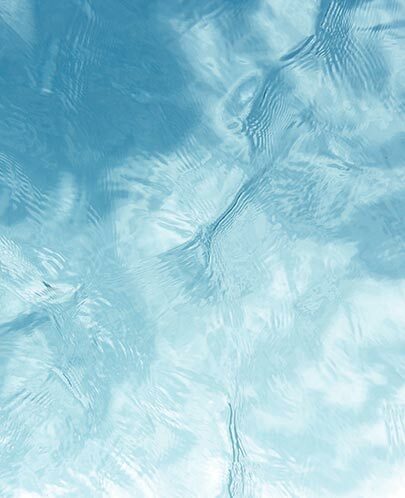 Aqualand Aqualand Australia is a property development and investment company. We aim to go beyond the expected, so we can create beautiful, intelligently designed living, working and shopping environments. 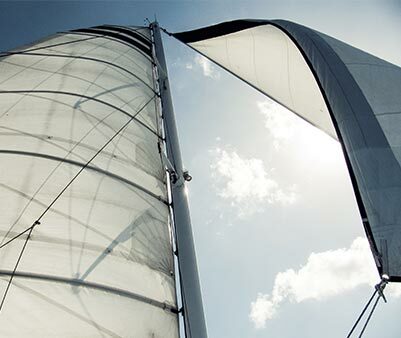 Our goal is to build a great company with our customers and partners in mind. When you talk to Aqualand you’ll find we design spaces with your hopes, dreams and expectations in mind; then we go beyond those. The one thing you can always expect is that we will always go that little bit further. We aim to inspire life. To delight and surprise our partners and customers. This is what makes us different. We achieve this by talking to you, and more importantly, by listening to you. Then we work with leading architects, interior designers and construction companies to create and develop contemporary residential and commercial environments. PTW Architecture PTW Architects is an interdisciplinary architectural and interior design practice, realising and delivering innovative, contemporary designs in multiple sectors such as luxury residential, mixed use, hospitality and integrated communities. Reflecting the social, cultural and technological evolution of modern life it transforms experiences and delight for people and communities. As one of Australia’s longest continuously operating architectural firms, PTW Architects continues to consolidate its practice in East Asia and leads significant renewal of its projects in the region that fulfil complex programmatic and site challenges. 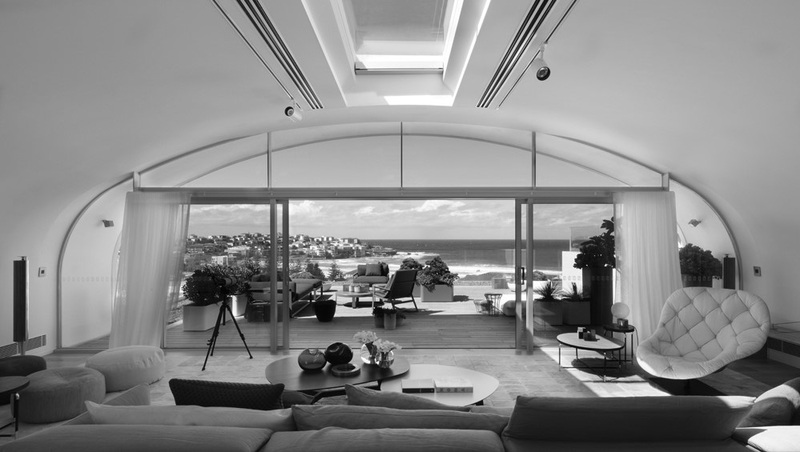 Suite 1, 118 Alfred Street, Milsons Point. © 2018 Aqualand Projects Pty Ltd.